Fifteen protesters staging a civil disobedience action on December 11 were led away handcuffed by New York police outside the U.S. mission to the U.N. Activists were holding “Let Yemen Live” and “Stop Bombing Yemen” placards. The U.N. protest formed part of coordinated protests at Saudi Arabian consulates in several U.S. cities. The action was timed to coincide with Human Rights Day. In New York, protesters were told to disperse by police outside the U.S. mission to the U.N. Monday, before fourteen of them are seen on Facebook live being handcuffed in zip ties and taken into custody. “I’m here because I am very concerned by the influence of the Saudi, Israeli, US military intelligence establishment on the entire US war machine, the so-called war on terror,” said Sander Hicks before he was led away in a Facebook Live post. The NYPD could not confirm how many people were taken into custody. The activists could be handed desk summons’ or could be arrested. 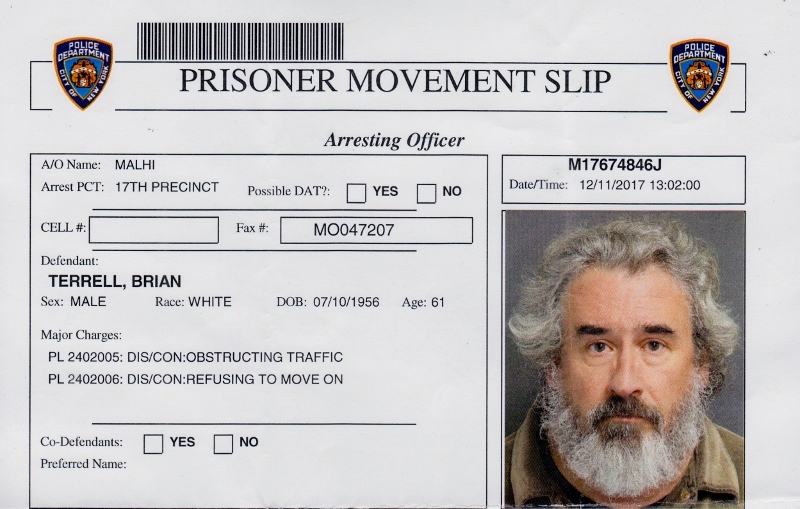 Hicks later told RT fourteen people were handed desk summons’ for disorderly conduct. Hicks said he was joined members from Veterans for Peace, the Catholic Workers, Grannies for Peace, and Refuse Fascism and Code Pink who later marched to the Saudi Arabia Consulate at the U.N.
Code Pink, a women-led peace and social justice movement, organized protests across the U.S. at Saudi Arabian consulates in Houston, Texas, Washington, D.C. and Los Angeles, California. 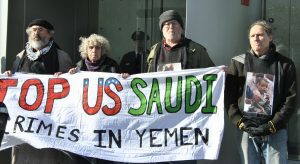 Activists were demonstrating against the U.S. supported Saudi-led war on Yemen, which has induced one of the largest man-made humanitarian crisis. The Saudi-led war on Yemen began in March 2015, as an effort to restore ousted President Abed Rabbo Mansour Hadi. Unable to defeat the loyalists of former president Ali Abdullah Saleh, aided by Houthi rebels which the Saudis claimed are backed by Iran, the coalition imposed a blockade on Yemen. The coalition includes the United Arab Emirates, Kuwait, Qatar, Bahrain, Jordan, Morocco, Sudan, Egypt and Pakistan. The United States said it was assisting with intelligence, targeting, and logistics. The war and blockade have plunged Yemen into a major humanitarian disaster, leaving 20 million people in dire need of aid. More than 11,000 civilians are estimated to have been killed in the conflict. Last Wednesday, President Donald Trump called on Saudi Arabia to immediately lift the blockade of Yemen and allow in food, fuel and medicine, citing humanitarian reasons. Trump’s call follows a U.N. appeal for a “humanitarian” stop to the airstrikes and fighting in Yemen, to allow for the delivery of aid to civilians trapped in the capital Sana’a. Saleh was killed Monday after he tried to break off the alliance with the Houthis and negotiate with the Saudi-led alliance. U.S.-backed Saudi coalition forces renewed their attacks on Sana’a in order to back up Saleh’s supporters. Violent clashes in the capital have resulted in at least 125 deaths this week, AP reported citing aid groups. On December 11, in response to the growing humanitarian crisis in Yemen, more than 50 concerned people including representatives of various peace, justice and human rights organizations and communities, gathered in New York City’s Ralph Bunche Park, across First Avenue from the United Nations. Our message, which was communicated on signs and banners and by speakers addressing the rally, was simple and direct: end the war crimes being committed by the military of the United States along with Saudi Arabia and its coalition partners abetted by the U.S. and end the blockade of Yemeni ports. For more than two years, Saudi/U.S. bombing has targeted civilian infrastructure: Hospitals, schools, factories, markets, funerals, sea ports, electrical power stations and water treatment facilities. U.S. drones strikes and incursions by U.S. Special Forces into Yemen have killed civilians as well. Armed conflict has directly taken the lives of some 12,000 people, but that tragic number is greatly exceeded by the number of those who are dying from a combination of malnutrition and otherwise easily preventable ailments and diseases like respiratory infections, measles, and cholera, including more than 1,000 children each week. 20 million of Yemen’s population of 28 million people are food insecure and few have access to clean drinking water. More than half of the hospitals in the country are not functioning. Early in November, the already onerous blockade of Yemen’s ports was made practically total, prompting the United Nations Under-Secretary for Humanitarian Affairs to warn that, unless the blockade of Yemen was fully lifted, “… there will be a famine in Yemen… It will be the largest famine the world has seen for many decades, with millions of victims. On November 27, limited exceptions to the blockade were made for humanitarian aid shipments alone. The resulting tightly controlled deliveries have been decried as an empty and vastly insufficient gesture by humanitarian aid groups, who are calling for the ports to be opened to all humanitarian and commercial shipments. Under this pressure, President Trump issued a very brief statement calling upon the Saudis to “completely allow food, fuel, water and medicine to reach the Yemeni people who desperately need it.” Trump’s uncharacteristically polite request was not backed by anything much at all, much less by a freezing of U.S. arms sales to the Saudis, nor did it address the practice of the U.S. Air Force refueling Saudi fighter jets in mid-air or the U.S.’ own drone strikes in Yemen. Clearly, the times demand that more be done to counter this dire threat and some voices are being raised. Along with robust diplomatic efforts, there are legislative attempts to curtail arms sales to the Saudis. There have also been fasts, vigils and protests such as occurred in New York and other cities on December 11. After speeches, songs and a powerful minute of silence, the rally moved up First Avenue to both the U.S. and the Saudi Permanent Missions to the United Nations, led by banners reading “STOP US-SAUDI WAR CRIMES” and “LIFT THE BLOCKADE”, followed closely by officers of the New York City Police Department. 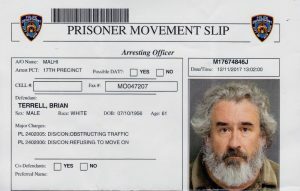 Some of us felt compelled by conscience to stand in the doorway of the U.S. Mission and after a short time, we were arrested for violating the “obstructing vehicular or pedestrian traffic” provision of the New York Penal Law regarding disorderly conduct. 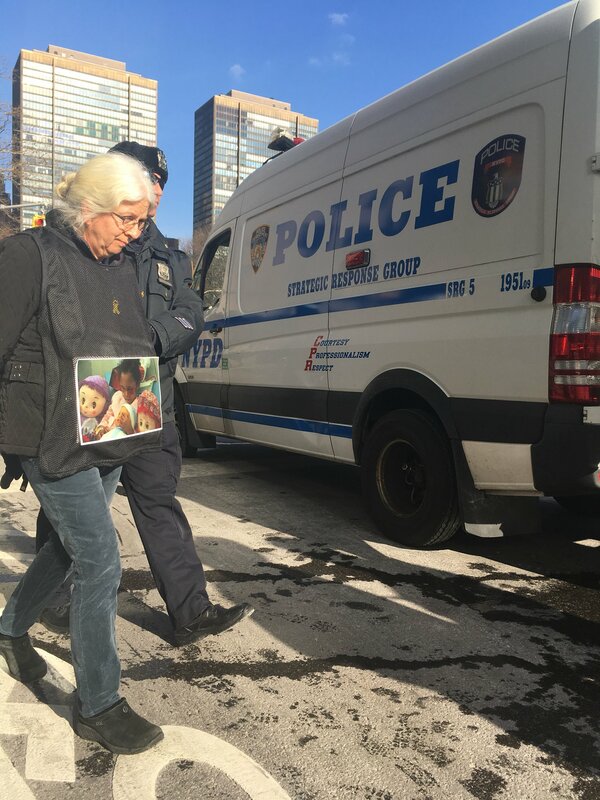 Fifteen of us, carrying photos of Yemeni child victims, were taken into custody and transported to the cells of the 7th Precinct on the city’s Lower East Side. I could not help but wonder as we were handcuffed and loaded into vans, how those police officers could listen so impassively to the denunciations of crimes against humanity being committed and to the disclosures of a blockade that threatens the lives of millions, orchestrated from the buildings we stood before. How could these officers, then, after hearing our pleas and the stories of starving children without reaction, move so decisively to remove our nonviolent obstruction to the perpetrators of those crimes? Did they not wonder if they were arresting the wrong people? The blockade of Yemen is an atrocious crime of the highest category, a violation of the United Nations Charter and the Universal Declaration of Human Rights and other international pacts. The U.S. participation in the war on Yemen is a violation of the war powers provisions of the United States Constitution, at the very least. The imposition of our modest “blockade” of the United States Permanent Mission to the United Nations, in contrast, threatened no one. No one got sick or died because we stood in that doorway. In New York State, disorderly conduct is a violation, not even considered a crime at all. Still, the NYPD choose to ignore murder committed on its beat and to expend its prodigious resources to arrest and to prosecute law abiding citizens who demand an end to the crimes against Yemen. Brian Terrell lives in Maloy, Iowa and is a co-coordinator of Voices for Creative Nonviolence. Fifteen peace activists arrested calling out: LET YEMEN LIVE! Blocking the entrance to the U.S. Mission to the U.N. on December 11, 15 peace activists from the Catholic Worker movement, Granny Peace Brigade, Raging Grannies and others called for ending the blockade of Yemen. The group also called for an end to the intensive bombing of homes, water and sanitation infrastructure being assisted by the U.S – resulting in a million cases of cholera (reported as the largest outbreak in a country in recent times) and millions of cases of severe and acute child malnutrition, an estimated 7 million facing starvation, new outbreaks of dengue and diphtheria, thousands dead and tens of thousands injured. With more than 50% of hospitals destroyed; many health workers unable to work due to the bombings or fleeing the violence; shortages of food and depleted medical supplies due to the blockade, only limited help is reaching those most at risk. Yemenis are now facing the biggest humanitarian crisis in the world. A rally at Ralph Bunche Park started the day’s events, with several speakers presenting insights into the conflict, including David McReynolds (two time presidential candidate), Carmen Trotta (New York Catholic Worker), Kate Alexander (Peace Action) and Isaac Evans-Franz, who read a moving statement by a leading American-Yemeni activist on the situation of children and women. The U.S. is not alone in arming and aiding the Saudi-led bombings: Canada, France, England, Germany and other countries are culpable in the destruction of Yemen, which has been and continues to be the poorest country in the region. Politically, the civil war is very complex, and many feel there will not be a military solution. Efforts are underway by peace groups to urge Congress to take action to end the U.S. complicity in the war, which started in 2015 by President Obama, but now is intensified by Donald Trump. While Trump has asked the Saudis to end the blockade to enable humanitarian action, the U.S. has not taken a stance to end the bombing. Of course not, as the U.S. government has sold billions of $$$ worth of bombs and advanced weaponry to the Saudis and recently, reportedly sold cluster bombs, deemed illegal under a U.N. treaty. Two groups of protesters formed. 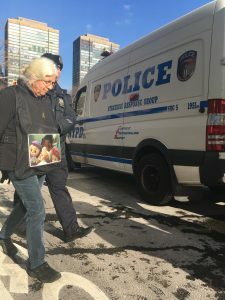 One marched to the U.S. Mission to the U.N., with a group (wearing vests with the photo of a child from Yemen) immediately blocking the entrance. A crowd of about 50 supported their action. A second group proceeded to the Saudi Arabian Mission to the U.N.
At the U.S. Mission, the group was left unhindered for almost an hour, but then the police moved in and gave the normal warning to leave or be arrested, and then proceeded with the arrests. Alice (Raging Granny/GPB) said one officer was a bit nasty, commenting that the protesters were wasting police time on a day when NYC faced its first suicide bomber attempt. Alice responded that as grandmothers, we are concerned about children dying here, Yemen, anywhere. She later mentioned that other police at the jail were more supportive, specifically saying that protesters have the right to stand for what they believe. Bev and Joan also felt the police were generally polite. Joan had a problem though. In the jail, she was asked to remove her shoelaces. Then the cop noticed the string around her trousers. He asked her to remove it, but Joan said she had nothing underneath! He relented to allow her to keep her pants up! At the Saudi Arabian Mission, a smaller group gathered. There was no indication that the Mission was there in the Institute of International Education (II E) office building. So a protestor held a sign indicating the site was also the Saudi Mission. There were more police than demonstrators! We peacefully blocked the main doors, but a side door remained open. Just before the arrests at the U.S. Mission began, all but two remained. At that time, with only two of us (Florino and I) there, security said we were blocking the door! We thought they were going to arrest us! To our surprise, they didn’t. As people entered and left, I called out: “End the blockade; stop bombing Yemen.” A man came out, looking particularly distinguished, walking towards a black diplomatic car, with someone who looked like a bodyguard. So I shouted my mantra! The gentleman turned his head to see where it was coming from. He didn’t look happy. Was he the Ambassador? Senior person in the Mission? I don’t know, but think they got our message. What was achieved? The crowd today was limited, as much of the city was closed due to a bombing attempt. Media coverage was limited to bloggers and some international news agencies, as NY media was across town. But still our presence was registered. And we will be back! Until the dying/killing in Yemen ends. We thank the organizers of the day’s events: Felton Davis, Carmen Trotta, and their colleagues from the New York City Catholic Worker and Isaac Evans-Franz, Action Corps NYC, among others. It is noted that other demonstrations were also underway that day, organized by Codepink in Los Angeles and Washington, D.C.
We urge calls and letters/emails to our Senators, Schumer and Gillibrand, and to our House members: Let Yemen Live!